Mon, Tue, Wed, Thu: 10 a.m. – 8 p.m. Monthly meetings: The Library Board usually meets the second Wednesday of the month at 7:30 p.m. Please check the calendar for specific dates. To assemble, preserve and administer books and related educational and recreational material in order to promote the communications of ideas, an enlightened citizenship and enriched personal lives. To provide a place where inquiring minds may encounter the original, sometimes unorthodox or critical thought so necessary to a society that depends for its survival on the free competition of ideas. To seek continually to identify community needs and to provide programs of service to meet such needs. The new library building is fully handicapped accessible: there are several parking spaces designated for handicap parking and a ramp provides wheelchair access to the building. All public spaces of the library, including restrooms, are accessible to wheelchairs as well. Click here for library news items. 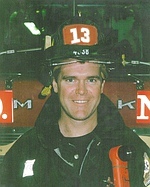 New York City firefighter and Sparkill resident Dennis P. McHugh (Engine 22 Ladder 13) was among the approximately 2,800 brave rescue workers and civilians who perished as a result of the September 11, 2001, attacks on the World Trade Center. The Dennis P. McHugh Foundation was established by the friends and family of Dennis to honor him and to ensure that his legacy lives on in as dignified a fashion as he lived his life. The Foundation focused its efforts by making a $500,000 contribution toward the construction of a new home for this library, which opened as the Dennis P. McHugh Piermont Public Library in March 2007. On September 23, 1896, The Free Library of the Piermont Improvement Association registered with the University of the State of New York. The certificate is signed by Melvil Dewey, then Secretary of the Public Library Department in Albany. Dewey is perhaps most well-known for inventing the Dewey Decimal Classification for libraries. The library had no permanent home for a few years, renting rooms over the ice cream parlor at Fort Comfort until one was found. In 1909 it opened in the Greek Revival home on Hudson Terrace which had been purchased from Charles Main for $3,000. A letter written in 1910 reports that the library “is now a permanent library having nearly 4,000 volumes with a circulation of 6,000 annually.” The money was raised by the Piermont Improvement Association, a group incorporated to start what was a “free association library” until the last moments of the twentieth century when Piermont voters authorized a change of charter. It is now legally chartered as the Piermont Library District, allowing the Library Board to go directly to the voters for budget approval. For most of the 100 plus years since the library’s founding, there has been a librarian at the helm. Addie Haring held sway for 15 years. Then came Elizabeth Lane Brodhead, who is still remembered by many of those who grew up in Piermont. Mrs. Brodhead served for 25 years. She was followed by Mr. and Mrs. Hugh White, Patricia Ternes (4 years), and Suzann Weekly Chute (4 years). Grace Meyer, who began in 1969, set the record, retiring in 2004 after 35 years. A new director, Victoria Lees, was hired that year and managed the transition to the new library building. Jessica Bowen took over as Library Director in June 2008. The directors have all had help from a variety of volunteers and salaried staff. Judy Miller, the first Children’s Librarian, started as a volunteer in the late 1960s and became an employee in 1968. Another volunteer, Paula Scholz, subsequently served as Children’s Librarian from 1972-79. Grace Mitchell became Assistant to the Director in 1979. In 1992 she was made Assistant Director and served in that capacity until her retirement in 2014. The library’s current support staff includes Nancy Russell who became Children’s Librarian in 2011, and Denise Starr who has served as Library Assistant since 2009. Lara Jacobs, who began her library career as a Page during her teen years, was hired as a Library Clerk in 2012, subsequently promoted to Library Assistant in 2015, and took over management of the library’s Local History collection upon Grace Mitchell’s retirement. In the 1980’s the Library Board made a decision about an issue that had been discussed for many years. We had to move. New quarters had to be found which would accommodate the needs of today’s patrons. While the old building was historically important and wonderfully charming, it lacked parking, was relatively small and was not accessible to those who had difficulty climbing stairs. The advent of the Americans with Disabilities Act sometime later confirmed the appropriateness of the decision. However, no suitable building was available in the Village, and so it became necessary to build. At the same time, Piermont Landing was developing, and an agreement was negotiated with the development group for the transfer of a parcel of land for the purpose of a new library building, as well as a monetary contribution to help in the cost of its construction. Then began an arduous process of planning the building. The Friends of the Piermont Library group was formed to help raise funds for the new building, and a Capital Campaign was begun several years later. The new building, opened in March of 2007, is named The Dennis P. McHugh Piermont Public Library, in honor of Dennis P. McHugh, a New York City firefighter who was killed in the events of September 11, 2001. His family foundation donated $500,000 to make this building possible and it will act as a lasting memorial to his life. The new building provides more space, wonderful views of the river, accessibility, designated parking, wireless internet access and much, much more. We trust it will build on more than a century’s tradition of community service and community participation, bringing a new era of library enjoyment to Piermont. Much of this history is excerpted from : “Piermont: Three Centuries”, published by the Friends of the Piermont Library in 1996. ​What is That Piece of Junk in Flywheel Park? That is the actual flywheel, really a piece of machinery, which helped provide power for the first factory in Piermont more than 100 years ago. It was installed in 1902, as part of a steam-driven generator, for the Piermont Paper Company. In 1924, the Robert Gair Company absorbed the older outfit, and was later itself taken over by Continental Can. The paper industry here kept chugging along until the mid-1980s when the facility, then owned by Federal Paper Board/Clevepak, was closed forever and the land sold for development. When developers of what you now see on this old railroad and factory site attempted to remove the flywheel, it wouldn’t budge. They tried a wrecking ball, which bounced right off. So it was decided that the flywheel would become a permanent part of the park, a sort of public monument to Piermont’s industrial past. Hence the name of the park, the gallery on Ash Street and our street, Flywheel Park West. Robert Gair was born in Scotland in 1839 and came to the U.S. at the age of 14. He served in the Civil War and subsequently started a small paper business in lower Manhattan in 1864. This business eventually grew to be one of the country’s greatest enterprises, covering a six block area on the Brooklyn waterfront, and expanding into different regions, including Piermont. Along the way, Gair had developed a new form of packaging after discovering a method used to cut and crease boxboard into cartons in one operation. His carton factory in Piermont was one of the largest, employing at one time up to 1,300 people.